Bose is known for making some great sounding audio gear, the best noise-canceling technology and weird looking ear tips. But what Bose never thought about making were wireless earphones...until now. The SoundSport Wireless are Bose's newest and first wireless Bluetooth sport in-ear headphones designed for active use and feature a sweat and weather-resistant design with up to 6 hours of playtime, a promising interference-free Bluetooth connection, and a secure comfortable fit using Bose's uniquely shaped StayHear+ Sport tips. How do they sound and perform out in the real world, though, is what we set out to discover to help you make the best purchase decision. 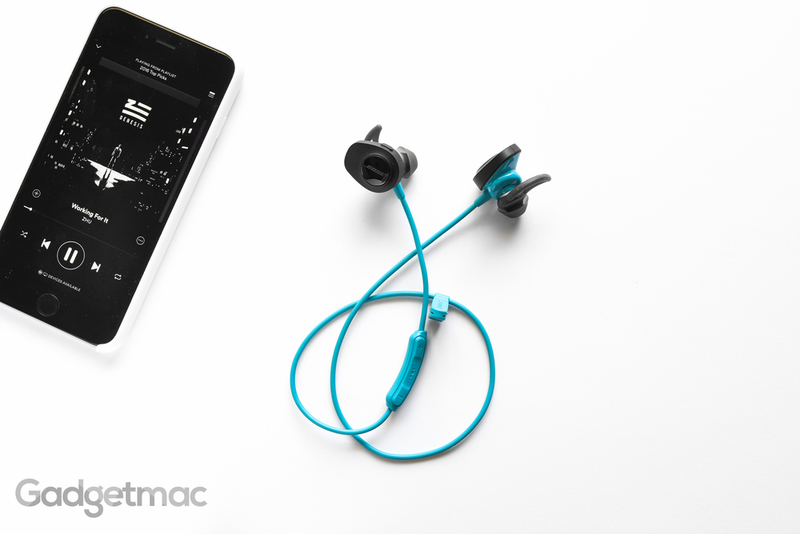 Head down under for the full review complete with a comparison between the Jaybird X2/X3! First thing first, let's take a look at what's inside the box. Bose packaged the SoundSport Wireless in some really great packaging that's easy to open and presents the headphones for the picking. Included is a relatively short micro-USB to standard USB charging cable, a decent neoprene carry case with a carabiner clip, and two other StayHear+ Sport ear tips; bringing the total available sizes to choose from to three: small, medium and large. For sporty wireless in-ear headphones this amount of accessories definitely looks to be lacking, but you'll soon find that this is actually all that you'll need to get the most secure fit possible. The StayHear+ Sport tips supposedly help create a tighter seal in your ears compared to Bose's standard ear tips, and they do, but I still find that the normal round tips included with every other pair of in-ear headphones provide a slightly better seal and noise-isolation. 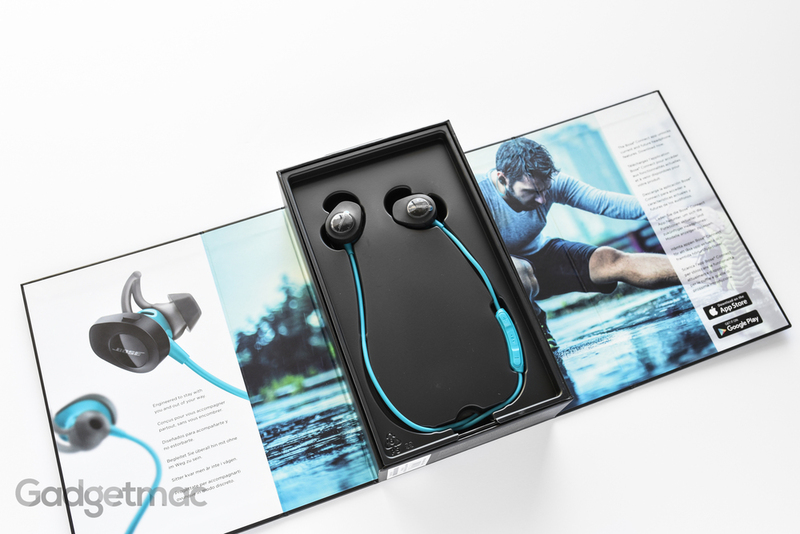 Available in an all-black and in this aqua blue and black colorway we have here, the SoundSport wireless are surprisingly competitively priced for a Bose product coming in at $150. That being said, they are essentially a wireless version of Bose's $100 SoundSport in-ear headphones, which have been sporting Bose's iconic design. These wireless versions on the other hand look entirely different. Bigger and noticeably so. The first thing you'll notice about the SoundSport is just how ridiculously huge they are. And once you've calmed down, you'll be pleasantly impressed by the high-end, albeit all-plastic, build quality. Yes they're big, but at least they also feel well made. The SoundSport feature a hybrid design of matte rubber lining the exterior and a hard shiny plastic inner casing that is both sweat-resistant and can even take being thrown around by some of you careless people. 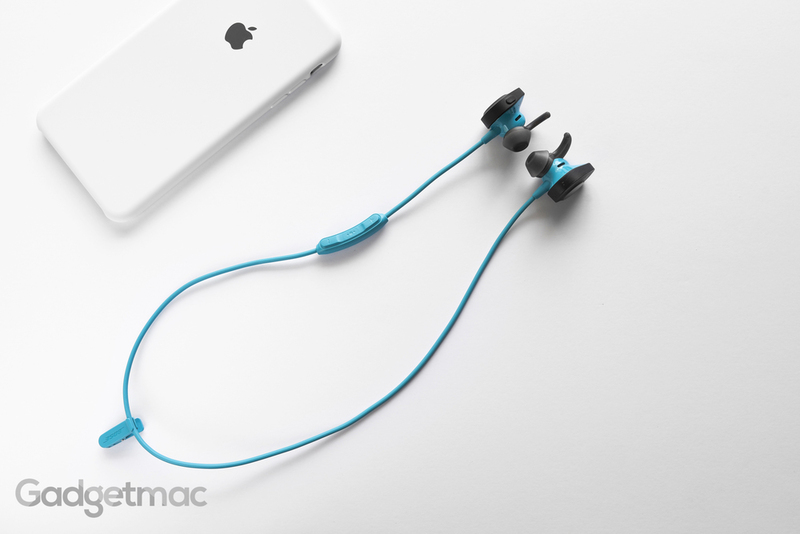 These are certainly much better made headphones than the more expensive Beats Powerbeats 2 Wireless. The only downside to wearing these out in public or even inside your own home is just how ridiculous you'll look with two big earbuds bulging out of your ears by as far as an inch apart. While they're not as strange to wear as they might look, the SoundSport are in fact the largest wireless in-ear headphones we've ever seen, which is a shame when other company's such as JayBird are only making them smaller and smaller as time progresses. You're really not getting anything special in return for having such monstrously sized earbuds compared to other options like JayBird's new X3 wireless in-ear headphones. Battery life is average, the sound quality isn't any better than much smaller wireless alternatives, and as far as special features go, there are none to be found. No heart rate monitor, extremely long battery life, and no built-in music storage to justify the increase in size. So why are they this big again? We may never know. Coincidentally, Bose does offer a heart rate monitoring feature with the similarly designed and soon-to-be-released $200 SoundSport Pulse model. Despite being such big wireless headphones, the SoundSport's amazingly soft ear tips fit inside the ears so well that they create a very secure and stable fit thanks to their streamlined integrated wings. I've been working out with these in my ears and not once did I need to readjust my fit or feel as though they were about to fall out. I honestly did not think I'd find the SoundSport to be as secure or as comfortable to wear as the Jaybird X2, but they really are that comfortable to wear even during the most extreme situations when sweat and intense movement are involved. Now after wearing the SoundSport for more than an hour or so, I did start to feel fatigued like I do with every other type of earbuds that Bose makes due to the unique shape of its proprietary ear tips. The sides of my ears would start to hurt for some reason whereas with other standard round tips I would never get such discomfort after a certain period of time. Of course what I feel my not necessarily be an issue for you. But it is something to take into consideration. Using the included cable clip, you can clip the SoundSport's cable behind your neck to your shirt for added stability if you find the cable to move more than you'd like. Thankfully it is on the shorter side so there really isn't a need to shorten it. If you'd like to know what the single worst thing is about the SoundSport wireless in-ear headphones is, it's not the size but actually their in-line remote controller. The buttons are terribly squishy and difficult to press with awful button press feedback. Such a small detail does indeed make for an unpleasant user experience. I typically use my remotes to constantly change tracks and volume so it's definitely a noticeable downgrade compared to other remotes such as the one built into the JayBird X2 and Freedom. Luckily however, I found the audio quality of this microphone to be one of the best. As for battery performance, you'll get around 6 hours of use out of the SoundSport wireless, or around 7 in my case. They're not this huge for no reason. The internal battery provides hours of use before having to plug in to charge. And you can find how much battery is left by either using the voice cues that the SoundSport provide, or on iOS devices, via the battery widget in Notification Center. Also, turning on the headphones will notify you of the battery percentage. The right earbud is home to a multi-function power button that allows you to toggle between different paired devices, and of course pair new devices. The SoundSport wireless also support NFC pairing by tapping the remote with a compatible device. Thanks to Bluetooth 4.1 Multi-Point technology, you can pair the SoundSport to up to three different devices simultaneously and never have to manually go into your Bluetooth settings to pair every time you want to switch between devices such as your phone, tablet or computer. The SoundSport will seamlessly allow you to switch between paired devices when playing audio, which is a very convenient feature to have if you're someone that likes to use multiple devices with a single pair of wireless headphones. Bose is the first company we've seen that has made an effort to ensure its wireless headphones have a clean wireless Bluetooth connection indoors and out with no interference. And I've got to say that so far my experience using the SoundSport so far has been great. I've had no drops in audio or any other type of interference when putting my phone in my pocket or leaving it far away. Even obstruction did not have an affect on the audio streaming as long as I was within a 30ft radius. When it comes to sound quality, the SoundSport deliver a solid and balanced performance with a good amount of bass and detail. Audio sounds very clean, clear and overall pleasing no matter what type of music you like listening to. That being said, and as big as they are, the SoundSport sound just as good as the similarly priced Jaybird X2 - but are seemingly a lot bulkier in comparison. You'd think that a company such as Bose would blow away these relatively new brands in the audio game, when in truth they're just as good and nothing more. That being said, the SoundSport are at least reasonably priced at $150. It’s worth noting that if you like to listen to music really loudly, the SoundSport are underpowered compared to other wireless headphones we’ve tested and require you to raise up the volume significantly in order to reach a normal listening level, with little extra room to get much louder. The SoundSport ironically do not block or isolate you from the outside like Bose's most popular noise-canceling headphones do, so any background noise will be easily audible while you wear these in your ears. Although playing music does naturally overpower most external noise. All this does have an affect on how good the audio sounds. When you have less isolation, bass tends to sound flatter when it cannot create pressure in your ears. The SoundSport wireless in-ear headphones produce great sound, have a relatively good battery life, are fairly durable and secure, and are somewhat comfortable to wear for extended periods of time. But since they're the largest of all the wireless in-ear headphones we've come across and wearing them for longer than an hour starts to feel uncomfortable, we really don't see the point of purchasing them over other comparable alternatives such as the Jaybird X2 and X3. Bose could have stood out by making a more compact offering with a broader selection of user adjustable ear tips, but instead settled for proprietary ear tips and the most oversized design for wireless sport headphones. If size and lack of passive noise-isolation doesn't bother you, the Bose SoundSport are a solid performing wireless sport in-ear headphones.